This fortnight at The Male Room, we are using Vellum on our projects. I have used Vellum as a layer over the top of some patterned paper. First though, I ran the Vellum through with an embossing folder to give it some texture. 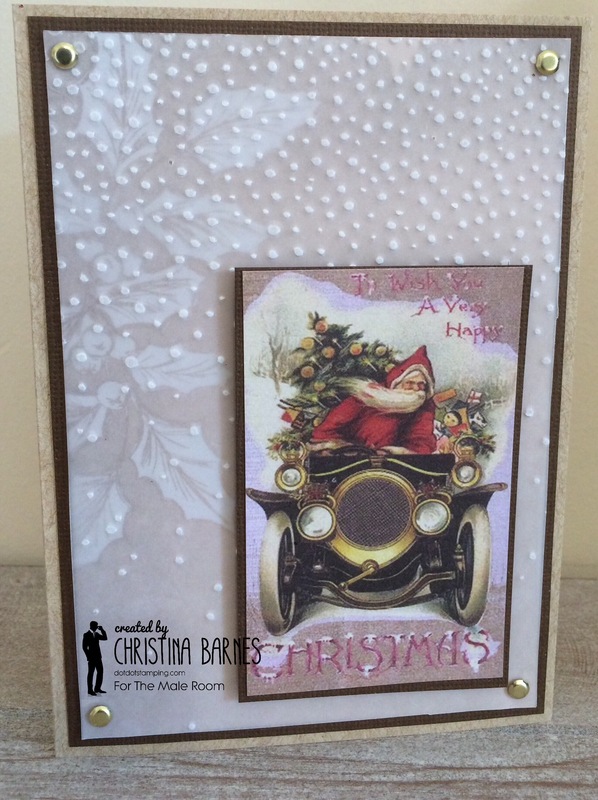 The gorgeous vintage picture of Santa in a vintage car is from some retired Kaszazz patterned paper. Such a gorgeous image!! I hope you will share your projects with us. The beautiful patterned papers from the Kaszazz Heartfelt range make papercrafting so very easy, whether that’s scrapbooking or in this case, a very pretty card. Not the best photo, the papers are soooo much prettier in real life. I have sponged the edges and done some faux stitching with a paper piercer and white gel pen. I wonder what else I can use this pretty paper for?? I do have lots of ideas, and I’ll share them with you soon. The current challenge at The Male Room is to use the colours Red and Blue in your project, and add one other colour. I chose green, I like this lovely bright colour combination for masculine cards. The cute sailing boat is part of the Swirly Bird stamp set. I have coloured the stamps of the different parts of the boat with markers, and then fussy cute them. The sentiment is an old one from a retired stamp set, again I have inked up the different letters with different coloured markers. Come over to The Male Room and check out the rest of the inspiration from the Design Team, and share your projects with us, we love to see your ideas. This week’s challenge at Crafty Boots Challenges is to make a Masculine project. Ah hah… my specialty! Yep, I really enjoy making those masculine cards, although I know plenty of you find it a challenge, so I hope you will find some inspiration this week. I wanted to use these gorgeous new papers, I thought this particular one looked a little “spacey”. So I combined it with a now retired stamp set, called Blast Off. The papers come from the Playful Palette Designer Series Paper Stack. I hope you will forgive the slightly blurry photo, we have had so much rain over the last week or so, that it has been difficult to get a good photo, but you get the picture!! Haha….. I hope you will join in with the Crafty Boots Masculine challenge, and…. Oh yes, the new patterned papers from Stampin’ Up! are stunning, so I wanted to feature two different ones on my card today. And I have used the sketch challenge from Mojo Monday 429 to design my card. The only stamping on this card, is the Happy Birthday sentiment, which comes from the Balloon Celebration stamp set. The background papers are from the Love Blossoms Designer Series Paper Stack, and the beautiful feature flower is from the Birthday Bouquet Designer Series Papers. I have used a circle die to cut it straight from the 12×12 sheet, although I really didn’t want to cut it up, it is too beautiful!! 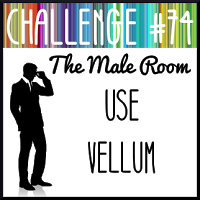 The new challenge from Crafty Boots Challenges is “Something Old, Something New”, which is just in time for the release of not just the new Stampin’ Up! Occasions catalogue, but also this years Sale-a-Bration, both of which start tomorrow (5th Jan 2016). So for my project, you get a bit of a sneak peek of some new goodies! My card uses some of the Perfectly Artistic Designer Series Papers as a background, from the Sale-a-bration catalogue. Then from the new Occasions catalogue, there is some gorgeous new Baker’s Twine, and the balloons are from the Balloon Celebration stamp set and Balloon Bouquet punch. That covers the “New” side. And for the “Old” I have used the Hello You Thinlits dies, and Crazy About You stamp set for the sentiment. I am loving this colour combination too, the pretty Blushing Bride pink combines beautifully with the Mint Macaron, but looks fantastic with the pop of bright colour of the Rich Razzleberry. Yum scrum!! Tomorrow I will pop up links to the new catalogues, and some more inspiration. And why not join in with this challenge at Crafty Boots. I was sorting through some retired Stampin’ Up! papers recently and came across these ones from a few years ago, and couldn’t resist making up a cute card. The only thing stamped on this card is the Happy Christmas sentiment, just lots of papers. Back tomorrow with more Christmas inspiration!